So many people today turn to Google to look up medications, ailments, symptoms, diagnosis, remedies, and wellness centers. In fact, at the start of a new year, the number of searches for gyms and fitness centers is at its peak. With more and more people seeking holistic lifestyles, and comprehensive wellness solutions, now is the time for fitness businesses to get noticed, and build an audience. If you’re from the fitness and wellness industry, it’s imperative that you understand what your audience needs. You need to catch hold of their pain points, and tailor your marketing initiatives accordingly. Last year, marketers noticed a need to cater to the common search, “wellness and fitness centers near me.” Assessing this search, and the audience’s needs, gave rise to local search engine optimization (SEO) and geo-tagging as common trends. This year, it’s time to take the next step. Learn the 2019 wellness and fitness trends, and harness them to further enhance your marketing efforts this year. These trends may not be new to you. In fact, most of these emerged in the last few years, but have recently become stronger and more impactful. Running with the trends is not always about doing something entirely new, but about strengthening existing strategies with a new approach. Let’s get to the fitness and wellness marketing trends you need to ace your marketing goals this year. Visuals make a strong impact and have the power to make people take desired actions – but only when they’re relatable. It’s time to get real. “Picture-perfect” is out, and “real” is in when it comes to videos and images in your marketing campaigns. For example, if you’re promoting your gym, instead of putting in pictures of photoshopped models, use images of your existing clients, with permission of course. Similarly, if you own a fitness and recreation center, make a candid behind-the-scenes video, instead of faking one that looks too pretty to be true. You could also get on the before-and-after trend by asking your clients to share their results, with a picture comparison. It’s all about showing the reality, instead of portraying something fake, just because it may appear better. Before you get started, check out the fitness industry imagery trends for 2019. To date, the fitness and wellness industry has limited its use of video marketing. Currently, the only videos one sees is a tour of the center, or maybe a video of people using the services. Go beyond that, and start investing your time and effort in creating interactive videos. For example, if you’re marketing your fitness and nutrition services, with a nutritionist expert on board, you could ask them to make a video about something that’s trending, like, “Five superfoods to include in your diet.” You could create tutorial videos for gyms, fact videos, or informational videos, targeting the common questions and problems faced by your audience. Looking at the current industry trends, only dental centers and cosmetic enhancement centers use social platforms to drive more business. No matter what services you offer, social platforms give your business a required boost. Social sharing is all about keeping your followers and audience updated, while also urging them to share. For example, you could create a post asking people to share their “before-and-after” pictures, workout tips, work out fashion, recommendations, and health tips. The more people share user-generated content about your facility, the more interactions grow, and so does your network. Social sharing also gets you noticed by the networks of your initial audience. Create a buzzing social community, and compel people to share. The emphasis here is on “self.” Everyone needs personalized solutions, especially when it comes to the fitness industry. Generic solutions are all over the internet, but what audiences want now is personalized solutions. This includes sending personalized workout routines, nutrition suggestions, or one-to-one personal consultations. The consumer focus is largely shifting to preventative health and self-care. It all comes back to current lifestyles of increased stress, anxiety, and unease. With that comes the need for self-care, and solutions that help people cope. Marketing your business in a way that shows people you can help enhance self-care can get you noticed. For example, when you make your email marketing plan for health and social services, include emails that talk about the need for self-care, and habits to develop to their lives. When marketing your business, your approach should be holistic. You have to let people know that you care for them, beyond the scope of your services. For example, if you’re marketing a chain of fitness clubs, don’t limit yourself to fitness tips and fun workouts, but also include wellness solutions. You could include healthy recipes in your email marketing, talk about the need to relax and rejuvenate at a spa for mental health, discuss ways to battle emotional stress, and other habits to add to their daily life. The key is to not sound like you’re selling your services, but instead, genuinely trying to help your customers live a healthier, happier life. As mentioned before, local SEO and geo-tagging tactics are necessary to come up as a search result for people looking for your services near you. With that, it also becomes increasingly important to focus on getting more genuine reviews for your business. You could send out an email to your subscribers, asking them to review your services. Additionally, asking your subscribers to refer you to their networks can organically build a list of subscribers and customers. More people are depending on online reviews, and referrals, when making buying decisions. Every industry has a number of influencers working to promote certain businesses. An “influencer” is a person with a large social media presence that has the ability to influence potential buyers by promoting or recommending the items to their followers. Get in touch with credible influencers within your industry to tap into their audience. People are more likely to believe reviews and recommendations from influencers and other users. You could send an influencer some of your products to review, such as gym wear, or ask them to visit your fitness and wellness center to share the first-hand experience with their audience. This can get you noticed and bring in more traffic to your website or social platforms. If you don’t already create specific landing pages for specific information, events, or categories, it’s time to start. You don’t want to lose out on potential customers only because they lost their way on your site, or didn’t find their way to the right page. For example, if you’re hosting a seminar on wellness with industry experts, create an RSVP post on Facebook, and make sure when people click the link it takes them directly to the page where they can register for the event. Landing pages are known to increase conversions and enhance the user’s experience. Here’s an example. The first image is a Facebook ad created to increase sign-ups, and the second image is the related landing page. There’s no denying that social media platforms have taken over other platforms. Your audience is out there, and using Facebook lead ads turns them into customers. Create lead ads that compel people to sign up. 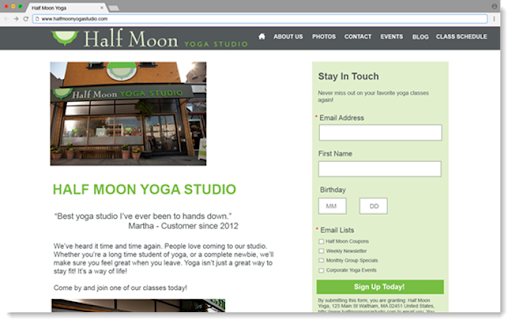 Use real images, catchy text, and a link that takes them to a dedicated landing page. Connect your lead ads with your email marketing platform to directly add the contacts to your email list. Here comes the “techy” part. Technology is undoubtedly changing the way we do business today, and it’s a boon for marketers too. Understanding analytics helps you get closer to offering customers exactly what they need, and making your services better with time. For example, analytics can help you assess the needs of the age group with whom you want to engage, their location, the products and services they’re looking for, and other customer behaviors that could help you reach out to them in a better way. With AI coming into the picture, email marketing for health professionals can be more targeted, reaching potential and existing customers with tools like A/B testing and automation. Spend some time this year to analyze how you can make the best of analytics and AI for your business. Now that you understand the need to keep pace with the latest trends, it’s time to tweak your strategy with focus, and add power to your marketing campaigns with the trends for this year. It’s all about knowing what works best for your business, and your audience. Combing the right strategy, with the right tools and platforms to support it, can get you noticed and make an impact. 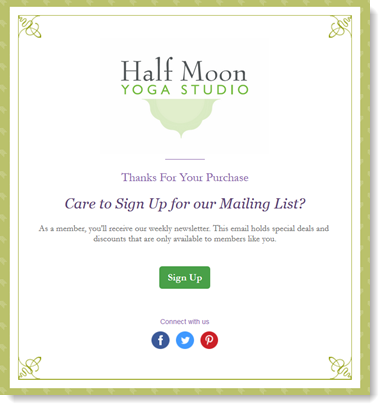 Get ready to take over the fitness and wellness industry with a stronger email marketing strategy.